Using Bates stamp software has now become the norm over manual bates stamping. Modern software stamps pages and documents electronically in the correct sequence and do so in a fraction of the time it takes do so manually. Coolutils have created a useful app called Coolutils Converter. This program offers an all-in-one solution enabling you to convert from most file formats to PDF or TIFF and stamp bates. The Coolutils program is timesaving, it cuts the time to bates stamp pages and documents by several hours per project and can save days' worth of work in an everyday law practice. Input formats include PDF, HTML, XHTML, MHT, TXT XPS, EPS, PCL, DOC, DOCX, RTF, MSG, ODT, ODS, XLS, XLSM, XLT, XLSX, TIFF, JPG, EML, Outlook emails. File types used for output include PDF, XPS, DOC, and TIFF. If other types are needed contact us, we may add additional output formats on request. Bulk convert your documents instead of tediously converting in small batches or individually. While converting bates stamps can be applied to all pages of any document. Customize the bates to your court stadards. Select the number of digits, size, color, and position of each stamp. Add any prefixes or suffixes you need. Use sequentional numbering or start over with each folder. When converting to PDF all types of user permissions can be set, whether to simply view or permit to print, edit or annotate too. Documents can be protected using a password. Convert emails and stamp bates - a rare feature in other apps. 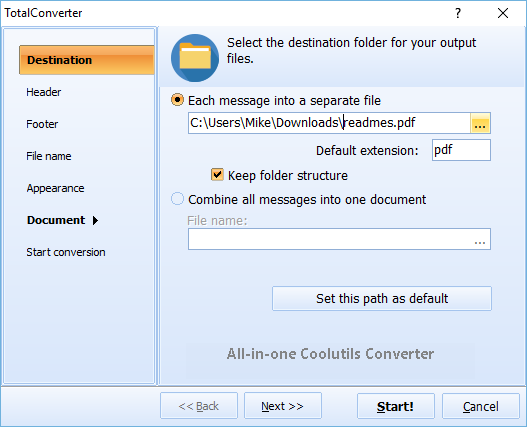 If you have to process thousands of Outlok emails or exported MSG files, Coolutils Converter will save them as PDF or TIFF with proper bates stamps. Rename files adding dates or counters or both to the file names. The wizard guides you through the process of converting multiple different file formats in seconds. The handy side panel provides you with a preview of what it will look like on completion. Are you still happy using your outdated version on Microsoft 2003? 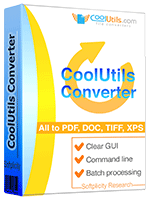 Coolutils Converter is compatible with all versions of Microsoft suite documents. Finding the right file fast is easy using the filter utility tab or you can sort the files by date, type, name or size quickly and easily. Protect your intellectual property or preserve its legal status using and image watermark in either the header or footer. Add your digital signature when convert any file/s to PDF. Enjoy the easy-to-use interface with hints for beginners. Coolutils Converter will integrate your numbering needs in the conversion process. You may use numbers only or a combination of numbers and letters. Coolutils Converter can apply predifined watermarks like confidential, for attorney eyes only, etc. to your documents as well. Should you need any particular text or option, don't hesitate to contact us. We will provide you with a custom tailor-made solution to fit your case perfectly. Coolutils Converter is very affordable. Personal license starts from $169.90 USD. All licenses are lifetime, no subscriptions. We offer bulk licenses for 10+ users of one company and SDK for developers. If you need a slinet converter for your server, we have developed a special version without graphic user interface. Find more info about our licensing here. Our software is very easy to use. Just a few clicks are required to start the process. 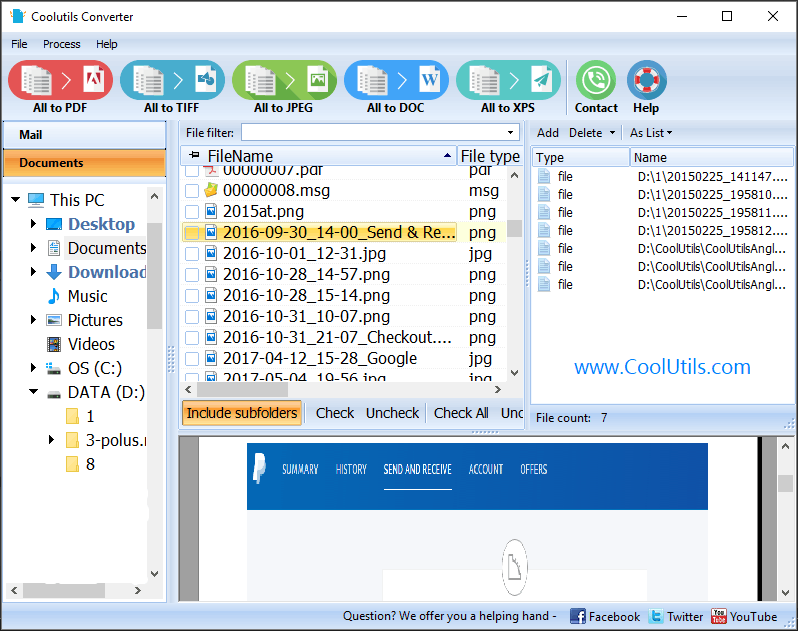 Download Coolutils Converter and install it. It will be launched automatically once the installation is complete. Select the files you want to convert by ticking on the boxes next to them. You can choose files in different folders in different places on your PC. Select the format that you want to convert them to (PDF, TIFF, XPS, DOC). Choose whether you wish to convert each file individually or save all the files into a single file. Select the destination where you want the converted file/s to be stored. Make all the settings in the wizard of the program. Default settings will not add bates. Download Coolutils Now and save your business time, and money. 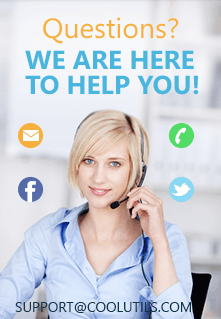 For usability and efficiency, you won't find a better product anywhere else. You don't need to invest in expensive software models that offers subscription fees. With Coolutils you enjoy a perpetual licence. Place your order now and start to process your files in minutes.